Was a piece of cake. Yet the piece was too large to me!? Finally, April is over. I’ll take Anjo mock exams in the coming Golden Week. Since I felt so uneasy that I wrote about my anxiety in yesterday’s diary, for which I received sensible advice from Nihao KT san, and considerate encouragement from Kawashima-san. Thank you very much! I’ve made up my mind to become just realistic about my current status. And the reality is that the circumstances don’t give me the luxury to go over ALL the topics before the exam. So, I’ll focus on what I’m really weak at for the last 3 months. In order to identify the topics I’m weak at, I’ll sit for the mock exam. I tried (useless?) resistance till 2:00 a.m. to prepare for the mock exam… but couldn’t wake up early in the morning, which means I studied as long as usual… sigh… I figured that what I’m weakest at is my own lazy mind. Hey, lazy nn, I’ll defeat you tonight!! April is almost over. Now I have no more than 90 days before the USCPA exam. I’m even fearful… But I deserve it considering that I’ve been lazy for many days so far. I’ve decided to take the ANJO’s mock exam from May 3rd to May6th. I’m afraid the result would be no good even if I take them now. But I decided to sit for them now, because I think the disastrous result would make me realize how little I’m prepared now and how much more serious I’ve gotta be. I appreciate it if anyone gives me any kind of advice about how to take advantage of those mock exams. If you have any idea, please leave your comment here. Now have only 2 days before the mock exams. I’ll go over all the topics again! 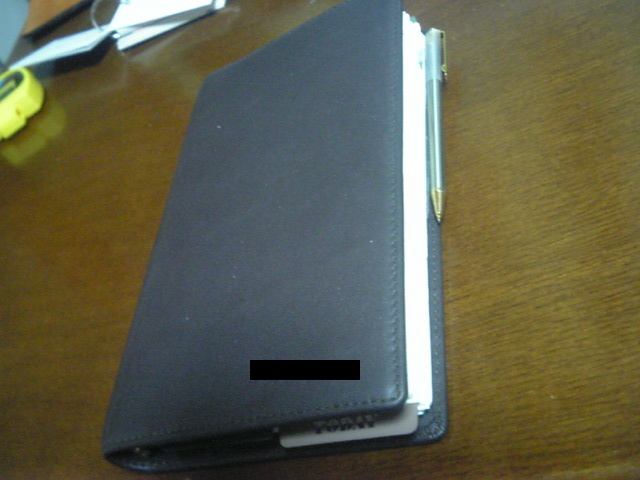 1. this is the notebook I always carry with me for my business, study, and private activity (I had my name engraved on the lower right ). 2. 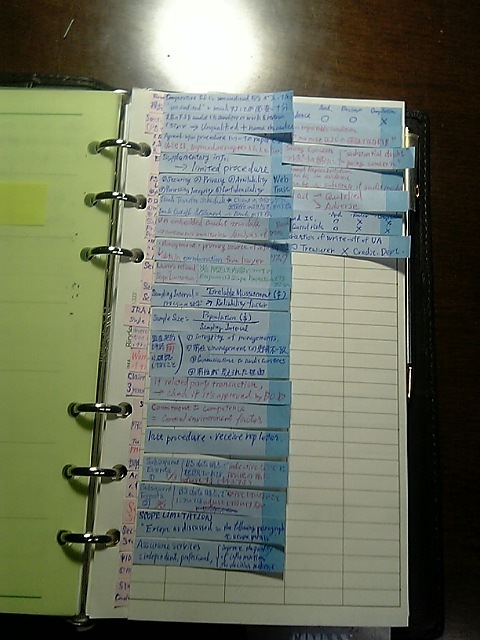 Since CPA “Post-it” slips spreads over the leaf with no room for additional slip, I decided to use accordion-type leaf. Those blue slips are all for Audit. 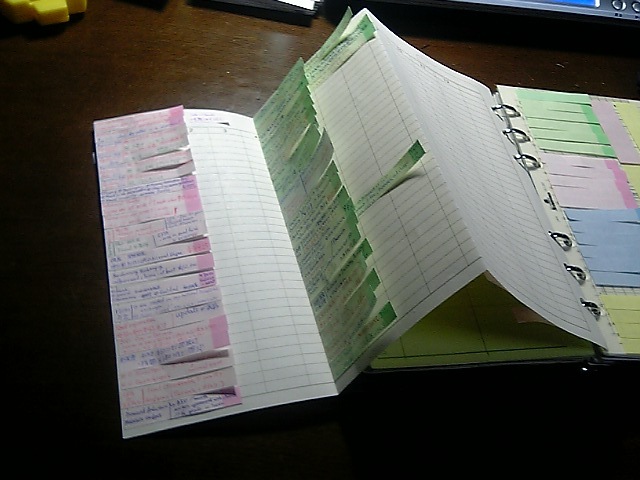 4. and flip over the leaf to view Law (pink) and Accounting (green) on the back of the leaf. Now all the staff have left the office except for me. I'm ashamed. The score of REG will be improved in a couple of days by getting used to the style of GLEIM problem, but AUD... I think I'm now used to AUD of GLEIM-CD, and still I'm below 75%. The result of GLEIM-CD for FAR was 60% this morning. I don't have GLEIM-CD for BEC. The GLEIM-CD for AUD/REG is a gift from my CPA exam mentor. I shouldn't waste his kindness. The GLEIM-CD for FAR is the one I bought by saving my monthly allowance for a couple of months. I cannot afford to waste it. Wiley books for FAR, REG, BEC, and AUD are also touched every day for Simulation practice. They are also very important and helpful to me. 啊, 现在, 午后八点半! 我已经要回家。 我今晚应该更学习。。。 加油,nn! I woke up at 5:30 a.m., when I found a Track Back notice from Kyoroich-san. It was about his ODAI. So far on my blog, I often refered to Kyoroich’s ODAI, or CPA quiz, which is provided on his blog. Thank you, kyoro-san, for your TB regarding your odai yesterday. Q. (FARE) There are 2 methods about pension plan. As you know, 401k is classified as "defined contribution plan." The other element is ??? Q. (REG) Please give me the 3 examples, which partners have to recognize gain/loss. The other type is called Defined Benefit Pension Plan, which had been a heavy burden for GM, which is now shifting to Defined Contribution Pension Plan. is limited to the partner’s basis of the PS interest. cash in excess of the AB of his/her PS interest. Ah, I’ve gotta leave for the office, now! See you. I felt I’m a bit hung over when I woke up at 5:00 a.m. this morning. That’s how I got up in this morning. I did GLEIM CD-ROM for 30 MCQs of FAR and for another 30 MCQs of AUD. The percentage of questions answered correctly was 60% for FAR part, and 70% for AUD. Too Bad. Do you think it’s hopeless having these scores at this point of time? It was 0:00 when I got home --- durnk. 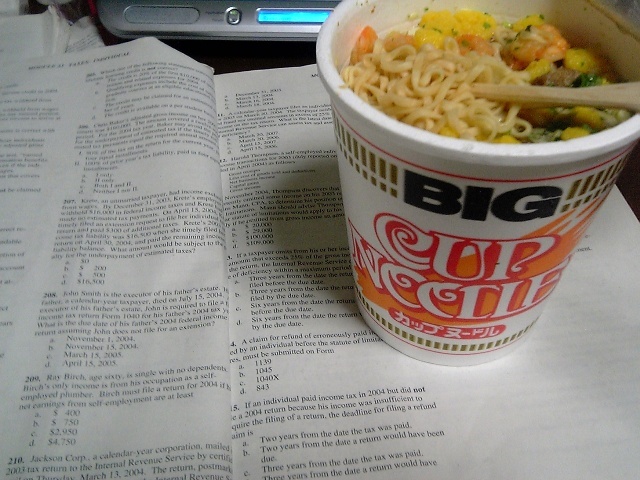 Since I couldn’t eat much in the party, I bought an instant noodle on my way back home. After all, having an instant noodle after a drinking is my pleasure. … ah, I’m full now, and it’s 1:00 a.m. I can study for an hour to do 2 or 3 SIMs. After that I’ll go to bed, and hopefully, I’ll wake up in 5:00 a.m. and start doing 30 FAR MCQs from 5:30 a.m. Can you do it, nn? Well, you must do it, nn. Comomo-san’s working hard. Ulala5151-san is sitting for the exam right now. How come you can give in to your weakness? Of course, you cannot! 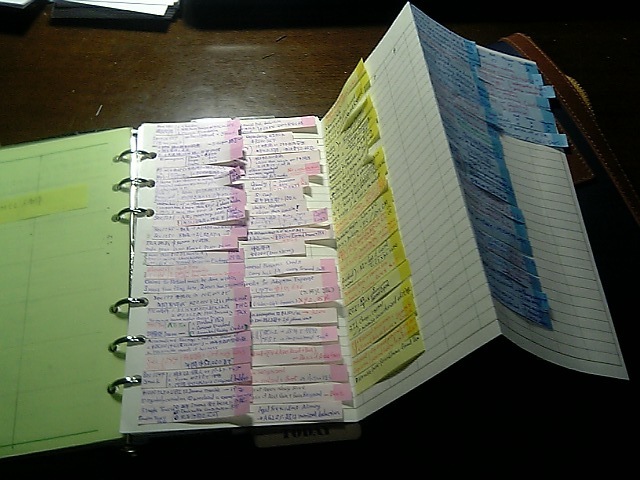 Studying for a long time could sometimes be inefficient, but it’s necessary to ensure certain volume of study. I’ll keep working on it. "A compilation is limited to presenting in a form of financial statements information that is the representation of management." I’ve believed it in this way for a year since then, but today I confirmed that my interpretation was correct with the help of CPA net. Having a talk with native speaker of English about USCPA matter is exciting, and it’s even more helpful when my doubt is concerned about a doubt about my interpretation of English. You can try it, too, if you have any.